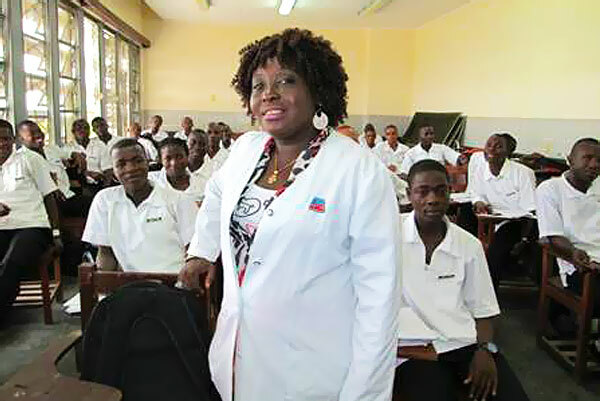 Rebecca Scotland, nursing instructor at Liberia’s Tubman National Institute of Medical Arts (TNIMA). Monrovia, Liberia–The midwifery student was visibly nervous as she tended to the woman in labor at the John F. Kennedy Hospital in Liberia. But nursing instructor Rebecca Scotland was there, full of encouragement, coaching her student—an aspiring midwife—through her very first delivery. Indeed, Scotland’s diligence in the classroom, focused attention in clinical settings and all-around supportive attitude earned her recognition as the “best teacher” at Liberia’s Tubman National Institute of Medical Arts (TNIMA). Students often cite Scotland as both an inspirational and effective teacher. Scotland credits her popularity to her participation in the Effective Teaching Skills Training Course, funded by the U.S. Agency for International Development through the Rebuilding Basic Health Systems (RBHS) initiative. Jhpiego supports RBHS to strengthen the education of midwives, physician assistants, clinical officers and other health care providers. In partnership with JSI Research & Training Institute, Management Sciences for Health and the Johns Hopkins University Center for Communication Programs, RBHS established improvement standards, assessed the quality of teaching at seven clinical sites across Liberia, improved teaching and clinical standards, built the capacity of nursing and midwifery faculty, equipped and supplied clinical simulation and computer labs, and developed a competency-based curriculum. She wasn’t always a beloved instructor, however. Scotland had graduated from school as a physician assistant and went on to get a bachelor’s degree in biology before coming to TNIMA to teach in the school’s physician assistant training program. Lack of effective skills in teaching was only one of the challenges reported at TNIMA during that time. Teachers came to school when it was convenient for them and gave lectures on whatever they felt like teaching. Morale was low and the faculty saw no avenue to improve the situation. Scotland was one of the full-time instructors at TNIMA when the RBHS program began, and the first pre-service strengthening course was on effective teaching skills. The Jhpiego-led program placed experienced international training experts alongside RBHS staff in a workshop environment. Mentoring, monitoring and follow-up empowered all 50 participating teachers. Since that workshop, Scotland has stressed the importance of preparation, as well as the vital importance of practical sessions in the simulation lab. Rather than relying solely on lecture, Scotland engages her students in discussions about skills and potential problems they may confront in their professions. Students work together in groups and role-play as a way to take charge of their own education.